2010 the travel site was Orkney, retro-researching for the fourth Amberlight novel - still hasn't seen the light of publication, but it's also still being revised, so probably just as well. 2011 turned out to be the Year of the Rivers - the Rhine and the Danube, both rivers I always wanted to travel, and in this case covering some of Eastern Europe, and a good number of places on the To-See list: Cologne - magnificent Gothic cathedral - Prague, so many superb buildings, including another Gothic cathedral par excellence - Budapest, Gothic church/cathedral in spades, and the Hungarian plains or Puszta as well. And then on down the Danube to the "new" countries of Slovakia (once the second half of Czechoslovakia), Croatia, once part of Yugoslavia, Bulgaria and Romania. With a side-slip via air to Istanbul, still one of my most favourite cities in the world. A perk of the trip was seeing some places that seeded my most recent short story to be accepted for an anthology. Called "Sister Anne," it's a recycle of the Bluebeard story, for a Book View Cafe anthology of retold fairytales. The sources were firstly, a Schloss in Bavaria, and second, the amazingly over-the-top "Mirror Cabinet" in the Prince-Bishop's palace at Wurzburg on the Rhine. 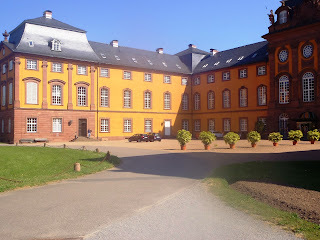 You're not allowed to take pictures of the Cabinet, but this is the frontage of the Schloss. Very imposing 17th-18th Century, comes complete with winery as well as everything else. Made a wonderful base for imagining Bluebeard's house. As for the fairytale, see the later post.